AoV2-139 / GA525 / SP&P045 Gather us O God Body spirit soul and mind (Monica Brown) Very simple song. Would work well as a gathering chant "Gather us O God, Body, spirit, soul and mind. Gather us, O God, One in union now with you. 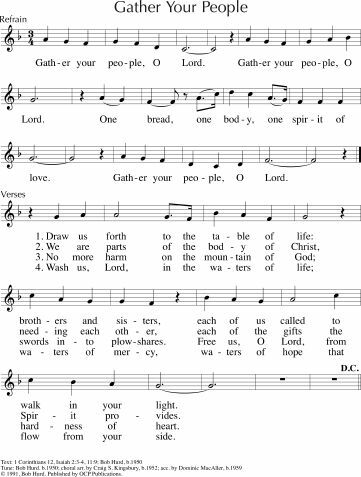 Also works at the end of the service "Send us out O God..."
MV007 Gather us in ground us in you (David Hann) A simple chant which would be great for an invitation to worship. TiS 647 / AoV2-012 / ATN 25 / STB184 Comfort comfort all my people (Robin Mann) This is one of my all time favourite songs. Easy to sing, beautiful lyrics. Chorus is “Comfort, comfort all my people, with the comfort of my word. Speak ye tender to my people, all your sins are taken away”. Note that there are extra lyrics at this link => Lyrics and mp3. AoVK-125 / ATW 489 Turn our sadness upside down (Leigh Newton) Good for kids, and adults too. Simple tune, but not so simple that it’s boring. Lyrics (search in the page for "sadness"). Iona (There is one among us) Lord you can turn all mourning into dancing (John Bell) An excellent simple refrain “Lord you can turn all mourning into dancing, evenings of grief to mornings of great joy”. Tune In / Online Resource You in all our worries / All will finish well (Dave Brown) “In this world where injustice reigns, you are in the midst of pain”. Excellent words of reassurance in a difficult world. Free downloadable songbook. TiS 670 / SiS569 / AoVK-138 / ATE 258 / CH692 / Srce385 / MP376 Jesus put this song into our hearts (Graham Kendrick) A fun Yiddish tune that gets even more fun if you get faster and faster as you go. Try teaching your congregation a simple side to side “dance” step. If you teach them and make it clear that it’s okay, you’ll be surprised how many people will join in. Good for kids. Youtube. Tune In: You in all our worries / All will finish well (Dave Brown) “In this world where injustice reigns, you are in the midst of pain”. Excellent words of reassurance in a difficult world. Free downloadable songbook. TiS 123 / AHB 48 / NCH488 / CH691 / UMH534 / VU652 / A&M594 / GtG819 / CP(E) 384 / W&R451 / Cha 566 / Src69 / Lau780 Be still my soul (Katharina Von Schlegel) Sometimes this can be a bit mushy, but the words are really very strong and helpful. Lyrics, sound sample, sheet music. Oldy-but-a-goody. *Tune In / Online Resource Come O God and visit us sick we pray / Your abundant life (David Brown) A joyful song "Lead us into your abundant life". This has been sung frequently by the musicians at BUC, but not by the congregation! Free downloadable songbook. *Public Domain: Freedom is a constant struggle (African-American) I love this song and I think it might work with this reading. Could be good used during prayers of confession or a time of lament. Lyrics. Historic sound sample. *NCH Psalter Our help is in the name of God (Jane Marshall) Simple refrain and good paraphrase of the Psalm for a cantor, chanting, or to be read with a response. *NCH497 / SFFS 2208 / GtG741 / PH354 / G(II)508 / GC707 / GC(II)684 G(3)780 / CP513 / ZSS141 Guide my feet while I run this race (African-American) An excellent civil rights song. Would work well as a meditative prayer for guidance or as an uplifting call to action at the end of the service.You could also make up your own lyrics. Lyrics. Good for kids. ATW 463 / Iona (T1AU) / ELW721 / SFFS 2219 / A&M835 / GtG750 / GC(II)451 / G(3)528 / W&R296 / URW436 Goodness is stronger than evil (Desmond Tutu / John BEll) Words from Archbishop Desmond Tutu. "Victory is ours, victory is ours, through him who loves us". Some congregations change the last line to "Compassion is ours, compassion is ours...". It depends on the context in which you sing it, I suppose. Sound sample. Good for kids. Linnea Good Blessed Be God (Linnea Good) This will need to be taught, but won't be too hard. Get one part of the congregation on the chant part (God before me….) while the others sing the top part, and then add in other parts as you are able. Online Resource In Bethlehem a Newborn Boy (Ana Hernández) A simple & quite lovely song that tells the story & updates it for today's world. Sheet music & lyrics. *TiS 319 / AHB 241 / CH314 / Lau141 / MP071 Child in the manger infant of Mary (Màiri Nic a' Phearsain) Words of the outcast, infant Christ who becomes the victorious Redeemer. Sung to the well known tune BUNESSAN. CH has the original Gaelic text. Oldy-but-a-goody. *VU77 / PH035 / GtG153 / 82Hml-246 In Bethlehem a Newborn Boy (Rosamond Herklots) Great words acknowledging the danger Christ was born into, the danger that still exists today, and Christ's redemptive power over it. The phrase "but down the ages rings the cry of those who saw their children die" is so powerful, and reminds me of families in Syria, on refugee boats, and in hospitals. The tune is suitably solemn and simple; somewhat formal. A&M077 / HPP141 / CP(E)60 / 82Hml-247 Lully lulla thou little tiny Child (traditional Coventry Carol) A very lovely and sad lullaby. I love this song; is it weird that we used to sing our baby to sleep with this song? Lyrics and sheet music. I've just listened to about 10 versions on YouTube. This is my favourite. And a version with a beautiful lute. Oldy-but-a-goody. *CH330 The tyrant issues his decree (Iain Cunningham) A song about the slaughter of the innocents that realistically presents the story and makes it easy to see the parallels with similar images from the news. Sung to a straightforward 15th century tune (AGINCOURT) Verse two: "Bewildered parents claw the air with shrieks of horror and despair, and all of Bethlehem laments the slaughter of the innocents." *MV111 / Online resource A voice was heard in Ramah (Carolyn Winfrey Gillette) Lament, death of children; peace; war; Good words to a very straightforward hymn tune (LLANGLOFFAN). Lyrics.